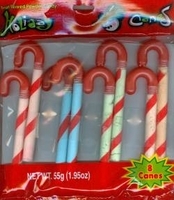 These holiday candy canes are a fun novelty Christmas Candy. Each pack come with 8 plastic canes filled with fruit flavored sugar similar to a pixy stick. You get 4 great flavors; Green Apple,Blue Raspberry, Cherry and Orange. These holiday canes make perfect stocking stuffers, Christmas present topper or add a string and hang them on your tree.